(2) steps that governmental officials are taking at every level to ensure the security of future elections. 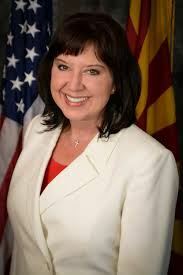 Arizona Secretary of State Michele Reagan is Arizona’s top election official, responsible for assisting in the administration of elections throughout the state. Secretary Reagan has led the efforts to fully reform Arizona’s elections law and streamline the election process. Secretary Reagan was intimately involved in the investigations surrounding the alleged cyber-security threats related to the 2016 General Election and work closely with local, state, and national agencies to ensure the security of the election administration. Her efforts have earned her a leading role on the National Election Cybersecurity Task Force as a member of the Association of Secretaries of State as well as the Executive Board of the Lieutenant Governor’s Association. Before her election to the state’s 2nd highest elective office, Secretary Reagan was first elected to the Arizona Legislature in 2002 and she transitioned to the Senate in 2010. While a representative, she had the honor of being the Chair of the House Commerce Committee where she is the youngest female to hold that position in Arizona history. With her transition to the Senate in 2010, Secretary Reagan became the champion of election issues in the state of Arizona with her desire to ensure that every Arizona resident has access to vote and can do so with confidence, knowing that our election system is both accurate and efficient. Her desire to improve Arizona elections resulted in the formation of the first Senate Elections Committee where she was proud to act as the Chairwoman. While acting as the Chair for the Senate Elections Committee, Michele committed herself to pursuing voter registration and education efforts, working with county and municipal officials to address their concerns with the election system, and spending time with current Arizona voters to work with them to make Arizona the nation’s leader in election integrity and ballot security.